My three-year-old daughter is constantly exclaiming “That’s not wrong!” when I am supposably doing something incorrectly. It is pointless correcting her because as soon as I say “No, that’s not right!” we get into a big wrong/ right muddle. So we let it go and know that all too soon she’ll get it ‘right’ and the endearing little mistake will be forgotten. Naturally, when I spied The Wrong Book by Nick Bland I had to take a peek. In the beginning of The Wrong Book we meet Nicholas Ickle, a little boy who is trying to tell a story. The problem is that Nicholas keeps being interrupted by characters from other stories – a pirate, a queen, monsters, an elephant and even some rats. “What are you doing here? You’re in the WRONG BOOK!” Nicholas protests to the increasing number of intruders. Preschoolers will enjoy the repetitive element of the book and I’m sure that after just a few readings, it will be one of those stories that children essentially take over the telling of. 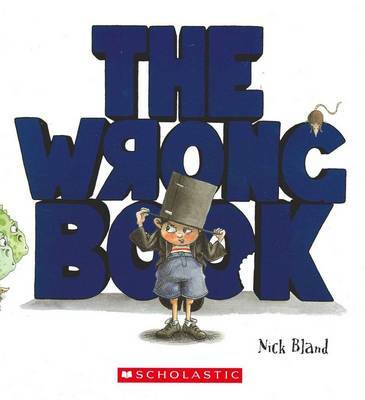 It’s worth noting that the louder and madder you become when reading this book, the more the kids will enjoy it, especially when they join in the ‘wrong book’ refrain. I won’t give away the ending, short of saying that we do discover what Nicolas’s story was going to be about just as the words ‘The End’ come crashing down behind him. The Wrong Book is $15.99 and is available from Fishpond.